This interesting surname is a patronymic from the Old French personal name "Herluin","Arluin" or the Old German "Erlewin", "Herlewin", composed of the Germanic elements "erl", warrior, and "wine", friend. The personal name dates from 1066, when the Domesday Book mentions a "Baldimnus filius (son of) "Herluini", and "Herluinus" (in 1086). The surname itself dates from the 13th Century. One "Roger Herlewyn" is recorded in the Pipe Rolls of Dorset, in 1230. "Simon Arlewine" is mentioned in the 1242, Liber Feodorum of Bedfordshire. A Richard Urlewyn is entered in 1279, in the "Hundred Rolls of Oxford". Agnes Herlyng is recorded in the "Poll Tax Returns of Yorkshire" in 1379. The "Subsidy Rolls of Staffordshire" (1524) record the name Robert Harlyng. In the modern idiom the surname has many spelling variations including Harlin(g), Hurlin(g), Arling, Urlin(g), Harwin, Herwin, etc.. On January 14th 1628, Mary Harlin married Richard Bloys at St. Dunstan's, Stepney, London. 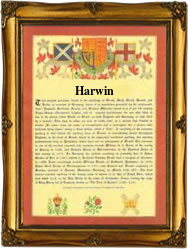 The marriage of Anne Harlin to John Dawson took place on June 9th 1641, at the same place. Anne, daughter of Andrew and Anne Harlin, was christened on March 24th 1649, at St. Lawrence Poutney, London. The first recorded spelling of the family name is shown to be that of John Erlewin, which was dated 1225, in the Calendar of the Patent Rolls, during the reign of King Henry 111, known as "The Frenchman", 1216 - 1272. Surnames became necessary when governments introduced personal taxation. In England this was known as Poll Tax. Throughout the centuries, surnames in every country have continued to "develop" often leading to astonishing variants of the original spelling.